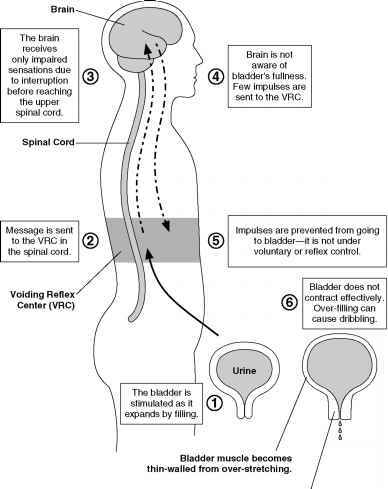 The elimination of urine by conscious choice is dependent on the integrity of the spinal cord pathways that connect the brain and the voiding reflex center. The downward command by the brain to "empty" causes relaxation and opening of the sphincter, whereas the command to wait signals the sphincter to remain closed. The pathways between the reflex center and the brain may be damaged or interrupted in MS, producing a variety of problems and/or symptoms. The specific nature of the problem depends on the location of the damage. 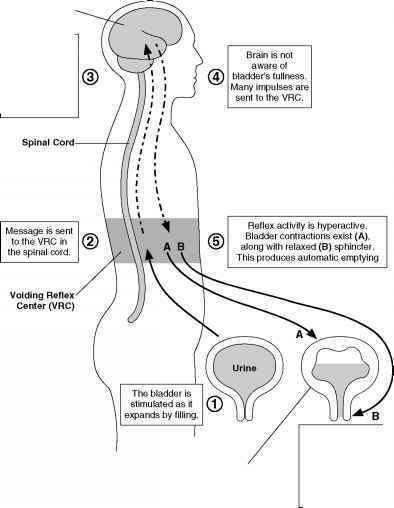 For example, if the connections between the reflex center and the brain are severely damaged, the reflex center may assume direct control of voiding and automatically stimulate the bladder to empty whenever it fills. The most common bladder problems associated with MS are increased frequency of urination, urgency, dribbling, hesitancy, and incontinence. Frequency involves an increase in the number of times urination occurs within the day. In some people, voiding may occur as often as every 15 to 20 minutes, usually in small amounts each time. The frequency of urination depends on the rate at which urine is formed and the ability of the bladder to store it. Urgency is the feeling of having to empty the bladder immediately, combined with an inability to "hold" urine once the urge to void is felt. People who experience this problem have little time to reach a bathroom. Dribbling is the leakage of small amounts of urine from the bladder. This may occur as the result of urgency and the inability to retain urine. In some cases, a person may only be aware of this problem when damp undergarments are noted. Hesitancy involves difficulty in beginning to urinate after the urge to void is felt. This symptom may be associated with urgency, so that one is unable to urinate while the urge to do so remains. Incontinence is an inability to hold urine in the bladder. It may result either from not being able to reach the toilet in time or from being unaware of the need to empty the bladder because of blockage of the pathways between the voiding reflex center and the brain. Despite the ability of the bladder to stretch as it fills, it can hold only a certain amount of urine and empties spontaneously after this limit is reached. Probably the most common type of bladder problem in MS results from a small spastic bladder, sometimes referred to as a "failure to store" bladder, which results from demyelination of the spinal cord pathways between the voiding reflex center and the brain (Figure B). Because the pathways to the brain are blocked, bladder emptying no longer is under voluntary control. Voiding then becomes a reflex activity, with messages to "empty" coming only from the spinal center. A small spastic bladder may produce symptoms of increased frequency, urgency, dribbling, and/or incontinence. A. The normal voiding process. The brain receives only impaired sensations due to interruption of pathways to the brain. Bladder muscle becomes ' thickened and spastic. The prescribed medication helps the bladder and sphincter muscles to work together properly. Conflicting or dysynergic bladder problem can be associated with either spastic or flaccid bladder. Bladder muscle and sphincter do not work together normally— resulting in a combination of symptoms. 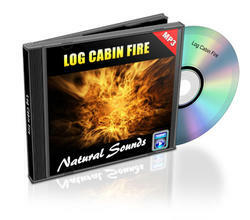 Bladder muscle and sphincter muscle relax simultaneously. When demyelination occurs in the area of the spinal voiding reflex center, messages cannot be transmitted to or from either the brain or the bladder. A flaccid or big bladder results (Figure C). The bladder fills with large amounts of urine, but because the spinal center cannot transmit messages on to the brain, the person is unaware of this fullness. 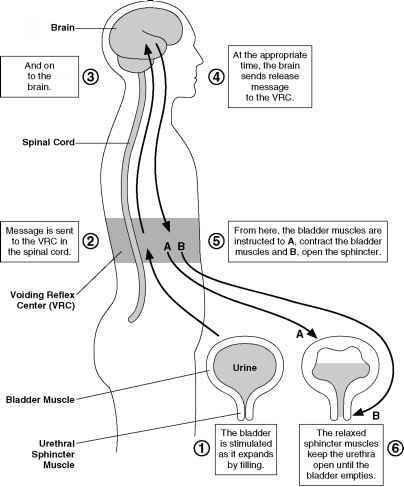 Because the spinal center also cannot transmit messages to the bladder and sphincter, there is very little voluntary or reflex control over urination. The bladder fills and then overfills, producing symptoms of frequency, urgency, dribbling, hesitancy, and incontinence. This situation sometimes is referred to as the "failure to empty" bladder. The third type of bladder dysfunction is the dyssynergic or "conflicting" bladder, in which the problem is related to coordination between bladder wall contraction and sphincter relaxation (Figure D) rather than to the size of the bladder. In the dyssynergic bladder, either (1) the bladder wall contracts while the sphincter remains closed, resulting in a sense of urgency followed by hesitancy in beginning to void; or (2) the bladder wall relaxes while the sphincter remains open, resulting in dribbling of urine or incontinence. This lack of coordination between the bladder wall and the sphincter frequently is seen in combination with either the spastic or the flaccid bladder. It is important to remember that the bladder does not make urine—urine is made by the kidneys. 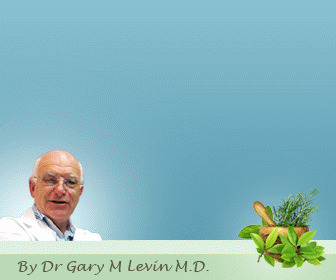 Disease of the kidneys is not a routine complication of MS. It only occurs if infection of the bladder is uncontrolled, and is surprisingly uncommon in MS, which makes the routine kidney X-ray (intravenous pyelogram, or IVP) for the most part unnecessary. However, the risk of urine backing up from the bladder toward the kidney is increased in a man with a dyssynergic bladder (women usually do not experience this problem because the pressures within the female bladder are lower). This potential problem must be carefully managed by a physician. What type of bladder problems are associated with MS?